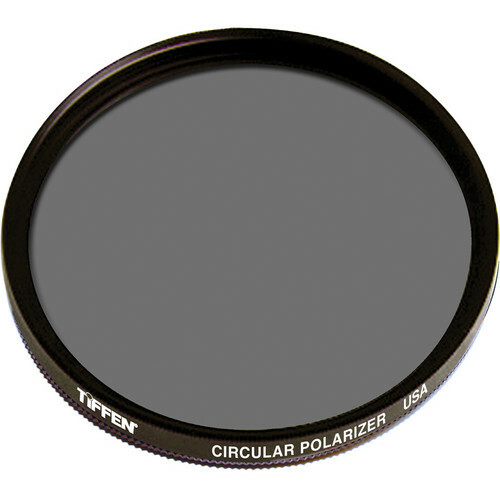 Tiffen 52mm Circular Polarizer Filters - Light rays which are reflected become polarized. Polarizing filters are used to select which light rays enter your camera lens. They can remove unwanted reflections from non-metallic surfaces such as water or glass and also saturate colors providing better contrast. The effect can be seen through the viewfinder and changed by rotating the filter. The filter factor varies according to how the filter is rotated and its orientation to the sun. 52mm Circular Polarizing Filter is rated 4.6 out of 5 by 153. Rated 4 out of 5 by Birdman from Good quality & price I use the filter for landscape and closeup flower pics. Very even polarization effect across the frame. I'm quite pleased with the filter, and will use it regularly in the field. Images of cloud effects over the Sierra mountains & Lake Tahoe have been fantastic. These filters don't work well when wearing gloves. The edge of the threaded ring, while grooved, is not easily accessible when installing and removing the filter. Motion of the polarizing ring, however, is quite smooth. Very little glare effects from the Sun, but best to use a lens shade. With proper care due any filter, I expect it to last a lifetime of service. Rated 3 out of 5 by Collin J from Decent at best This is a budget filter. I don't claim to be a professional but this filter isn't even up to par for an enthusiast. The mount on it is very weak and never seems to thread on correctly. Optically it is sufficient but from time to time it actually will fall right off the lens while you are turning the ring. The ring action is smooth and relatively consistent. If you are looking for one of these I would suggest looking at something like the Hoya multi coated one for only a little more. Rated 4 out of 5 by Bornoffire911 from Best Bang for the buck I have the 62mm version and it does its job and does it well. You have to watch out for the threads. I been lucky so far but it's easy to get the threads stripped if your not paying attention. One thing I do like is it's durability. I was taking shot of a stream going into a lake standing on a trail bridge. After twisting several times after several shots I decided to call it a day. As I took my camera off my tripod I heard a thud hit the deck and splash. I looked sure enough my polarizer twisted off went into the stream. I found a long enough branch to reach and coral into over rocks and other sediments. After retrieving there was not a noticeable scratch. Rated 1 out of 5 by 1 Wire Loose from Weak Construction The filter works great once it is installed. Threading the filter onto the lens is a challenge. The threads do not properly engage the threads on my Nikkor 18-55mm lens and the filter tends to come off of its own accord. I finally resolved the issue by putting my UV filter on the lens and threading the polarizer onto the UV filter. So far, this works. I would recommend spending a little more for a better constructed filter. Rated 4 out of 5 by hughstimson.org from still sometimes useful for digital Some people feel that polarizers are made obsolete by photoshop, but having travelled through the southwest with this cheap filter as an experiment, I am convinced otherwise. Deepening the blue of the sky at the time of capture means the sensor isn't trying to span as wide a dynamic range, which I speculate improves tonal detail. More importantly, the deep blue always looks great in pictures of sunny days, and recreating that depth in photoshop can sometimes enhance noise or bring in other artifacts. Finally, reducing haze means that landscape shots have more detail and depth, and clouds stand out more against the sky, rather than blending in. I had also hoped to use it to shoot through windows, in particular on planes and trains, but I found that the refraction in the kinds of window materials used there made it such that the polarizer produces weird vignetting effects. Useful in cars though. It depends what angle the sun is to your shot, but in some cases it can reduce or eliminate reflections from within the car. Rated 3 out of 5 by Anonymous from OK For the Price For the price, the filter is OK. Reflections are minimized, but the contrast is only fair. Compared this one to a Marumi I had purchased for another camera and the Marumi was far better. Contrast and color saturation were much better. The blues at wide angle were more evenly dispersed. The adjusting ring is smoother. The Marumi was about 4 times the price, though. If you need an inexpensive CPL to minimize reflections and use at moderate to high zoom this will get the job done. If you are interested in better definition, contrast, wide angle and green/blue saturation, look elsewhere. I wouldn't recommend this for landscapes, but would for an inexpensive way to remove reflections on cars at a car show. Rated 5 out of 5 by Anonymous from Crystal Clear This filter is great for taking pictures by the water, where it cuts through all of the sun glare and ripples to produce a perfect and clear photo. Same thing in foggy areas; it was almost as though the fog wasn't even there, the colors were not obscured at all. The only problem that I've seen, though it has not happened to me, is that others have had the same filter shatter on them, but I think this has less to do with the lens construction and more to do with their treatment of it. Rated 5 out of 5 by Jocko463 from Excellent filter ... ...resonably priced and made in USA. I use a polarizing filter in lieu of the classic sky filter for protection of the front lens element. The Tiffen line of filters works for me. I suppose there are more expensive, better(?) filters out there but I am more than happy with the results I get using Tiffens ...so why pay more? I find the polarizer a lot more functional than using the traditional sky filter for lens protection. I normally shoot landscapes and outdoor scenes and the effect of the polarizer can be dramatic, subtle or neutral depending on how I adjust it and how the light is falling on the subject. While polarizing effects can be mimiced by Aperture and Photoshop, the results are lacking as compared to those created by using the filter. About the only time I swap in a 1-A filter is when shooting in very low light conditions. The polarizer will up your exposure time or widen your f-stop to compensate as opposed to using a sky or clear filter. Great: Price; Quality; Results Not-so-Great: Dust has a tendency to creep in between the elements of the filter; the filter cannot be disassembled for cleaning. However, in the four years I've owned this filter, dust between the elements has not been a problem with picture results. I highly recommend the Tiffen polarizing filter. It is well-made, produces a wide range of effects and offers excellent lens protection and value for the money. Will this work with Nikkor 18-55mm and Nikkor 55-300 mm lenses? This filter will work with any lens with a 52mm filter thread. I notice this filter is not multi coated. I would be using this on the water. Does multi coating make a difference? You'll want a good multi coated filter in the long run. Anytime you shoot into the light you can get flare or loss of contrast without multi coating. Will this fit the Panasonic Lumix DMC-LZ30? This filter will fit any lens with 52mm filter threads. What is the possibility of vignetting with this lens if I use a 18-55 or 18-200 mm lens? I don't know as I have not used 18-55 or 18-200 mm lenses. Is this the proper size filter for my Nikon D3100 with a 18-55mm lens? Yes it is the proper size filter.